Although the mountain bike Downhill Course closed for the season on September 24, the mountain bike Flow Trail will remain open for business until October 8. Come and experiencing the nature of Niseko as it plunges deeper into Autumn, with an invigorating mountain bike ride! Its distinctive feature is the winding shape made using the ski resort’s slopes, allowing you to glide naturally across the banks and waves like flowing water – hence the name. The banks and turns in particular make it feel close to skiing, so this is a track that skiers and snowboarders will enjoy with delighted surprise. 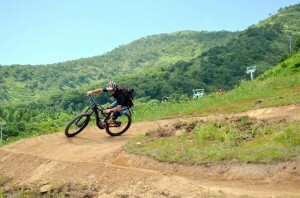 The 1,400 meter long Flow Trail is a course that lets you feel the exhilaration of mountain biking in Niseko’s vast natural environment.